As with most things in life, the older people get, the more attention they have to pay towards maintaining their health. Just as knees and backs begin to creak due to a lifetime of wear and tear, so to do our teeth. Considering the amount of munching, crunching, gnashing, and noshing a person will do over the years, it’s quite remarkable how well our teeth holdup when exposed to this kind of daily use and abuse. However, despite this resiliency, your teeth do eventually begin to wear down as you age. Here’s what happens to teeth as you age, and what you can do to help keep your teeth healthy and strong for years to come. One of the biggest threats to the health of your teeth is acid erosion caused by starchy and sugary foods. When eaten, these types of carbohydrates begin to ferment, which causes the sticky bacteria in your mouth known as plaque to produce harmful acids. These types of acids begin to quickly eat away at your teeth’s enamel. When given enough time, this acid will create small divots in your teeth where tooth decay can begin to form. While most people assume that eating foods high in sugar is the worst thing they can do to their teeth, drink sugary beverages can actually cause greater damage. Sweetened carbonated beverages, such as soda and some sports drinks, cause more damage to your teeth because the carbonation in the drinks increase the acidity levels in your mouth. To help prevent the affects of acid erosion, make sure you don’t overdo the number of sugary foods, and carbonated beverages you consume on a regular basis. If you find yourself craving something sweet, try chewing on a stick of sugarless gum instead. Chewing gum actually increases the amount of saliva in your mouth, which helps to wash away harmful plaque acids that damage the health of your teeth. Also try to avoid snacking throughout the day. When you eat a large meal, your mouth produces more saliva, which, again, helps to wash away the acids that form in the mouth. However, when you grab a quick candy bar or bag of chips, your mouth produces much less saliva. This results in more food particles clinging to your teeth and plaque producing more acids. Finally, make sure you brush and floss daily. Flossing removes any lingering food particles that may become stuck between your teeth, while brushing helps to remove harmful acids and excess plaque that builds up in the mouth. Your teeth function mostly on a mechanical level. They mash and grind just like a mortar and pestle so you can easily digest the foods you consume. Despite the resilient nature of your teeth, they can become cracked or chipped when biting down on something hard. This is why dentist recommend that you never use your teeth to tear open objects or to pop the top off of a bottle. Teeth that have been filled due to cavities or undergone root canals are more likely to chip or crack, as they no longer have the same amount of strength as your other healthier teeth. Individuals who frequently grind or clench their teeth, a condition known as bruxism, can also cause undo stress to the health of their teeth. Usually brought on by stress or anxiety, bruxism can wear down the health of your teeth over time, making them more susceptible to the effects of decay. To help reduce the affects of wear and tear on your teeth, avoid munching on ice cubes and other types of hard food. Take the time to make sure any item you’re prepared to bite down on doesn’t contain a pit, such as olives, popcorn, or cherries. 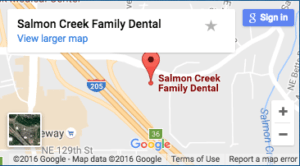 You also need to make sure you visit Salmon Creek, WA dentist Dr. Nelson regularly so he can look for any broken or cracked fillings that could weaken the strength of your teeth. If you routinely grind or clench your teeth, Dr. Nelson can help you deal with bruxism by providing you with a mouth guard for you to wear while you sleep. Another frequent oral health problem for seniors is dry mouth, or xerostomia. Individuals who suffer from dry mouth have a significantly higher risk of developing tooth decay and gum disease. A regular, healthy flow of saliva in the mouth is needed to neutralize harmful acids and to wash away lingering food particles. In seniors, ill fitting dentures, certain types of medications, and a variety of diseases can cause dry mouth. If you notice a drop-off in the amount of saliva your mouth produces, schedule an appointment to talk with a doctor. A prescription change may help to eliminate the problem, or you may need a refitting for your dentures. Until you saliva levels return to normal, try chewing on sugar free gum.